So, how can you prevent yourself from becoming too isolated? The answer is to connect with other parents. Here we’ll look at some of the best ways to connect with other parents and stop yourself from feeling like you’re going insane. Local baby and toddler groups are perhaps one of the most successful ways of making new friends. It’s something both you and your little one will enjoy as there are plenty of different types of groups out there to choose from. Baby yoga, music, sensory, ballet and story time groups are just some of the different activities available. As you attend these often weekly groups, you’ll start to develop friendships. Soon you’ll be off, out to coffee mornings and arranging playdates. If you’re trying to save money, just getting out of the house for a walk to the park gives you the opportunity to connect. You’ll meet other parents who you can strike up a conversation with. Or, maybe you’ll bump into people who stop to admire baby and they have friends or relatives with a child the same age. People generally love to connect with other people. So, you’ll have no problems connecting with other parents while you’re on a local walk. You struggle to keep up with your own child so the thought of starting your own playgroup can seem outrageous. However, if your little one is only in their first year, a playgroup will actually benefit you and other parents more. This is because although yes you will have more children to look after, you won’t be alone. Their parents will be there too so you can get to know one another, have a break and have actual adult conversations. You can advertise your new playgroup on social media too. You’ll be amazed how many local parents would go to a playgroup; especially if it saves them money. You could offer the group for free, but ask parents to bring their own drinks or food if you don’t have a huge budget to work with. The internet has provided parents with a wonderful opportunity to meet others. From forums to dating sites – it’s amazing how you can find other like-minded parents online from the comfort of your living room. As a matter of fact, we have our own forum that we’d love to have you join. We promise it’ll be the friendliest parenting community you’ve ever been a part of! There’s even groups online you can join which offer members the chance to meet up and partake in numerous activities. Of course, these online forums and sites aren’t just great for meeting up with other parents – they also offer a lot of support on everything parenting related. Making friends online first is a particularly great idea for shy parents who struggle to strike up a conversation with others in person. Keep in mind that you’re welcome to join our forum completely anonymously, and you’re welcome to partake in discussion as little or as much as you’d like to. It’s not just your computer that can help you to find new parent friends. Your phone is also a fantastic resource! Did you know that there are apps designed specifically for parents to make new friends? Some are designed as a dating app, while others focus entirely upon platonic relationships. So, think about the type of friends you’re hoping to meet and find an app which best fits your requirements. Smile Mom – An app designed to help you not only connect with other moms with similar aged children, but to get advice too. It’s free to use and helps you connect with people locally, as well as giving you the ability to arrange playdates. MomCo – Another fantastic free app MomCo allows you to search for and connect with other moms nearby. It also lets you schedule playdates, get support and find up-coming events. There’s an additional bonus that the app also offers discounted and promoted goods. Hey VINA! – This unique app works a lot like Tinder, only it’s not a dating app. It matches up women who have the same things in common. You get to see pictures, view their profiles and get matched up depending upon results from quizzes you can take on the app, your location and whether you have any mutual friends. These are just some of the great apps designed to make it easier to meet new parent friends. Thanks to technology it really has become so much easier to connect with others, even when you can’t leave the house sometimes. However, there are some factors you need to take into account. It’s one thing knowing where to find new parent friends, but what about how to do it? While it is possible that other parents may approach you while you’re out and about, it’s important to not rely too much on others. Instead, you’re going to need to put yourself out there. This means making the first move. Don’t be afraid to strike up conversation with other parents. It’s not always going to work, but unless you try you’ll never know. Also remember it’s more of a gradual process. You’re unlikely to go out one day and make an instant strong connection. You’ll likely need to make small talk over a period of time before you can actually make meaningful friendships. Finally, if you decide to try out the online methods of making connections, it’s imperative you do so with caution. You never know who you’re chatting to and internet safety rules don’t just apply to children. So, always try to chat to the other parent on the phone or over Skype before you agree to meet. Also, arrange to meet in a public area. Overall, it can be difficult knowing where to start when it comes to connecting with other parents. The above tips will help and thanks to the internet, it’s easier than ever before to meet likeminded parents. 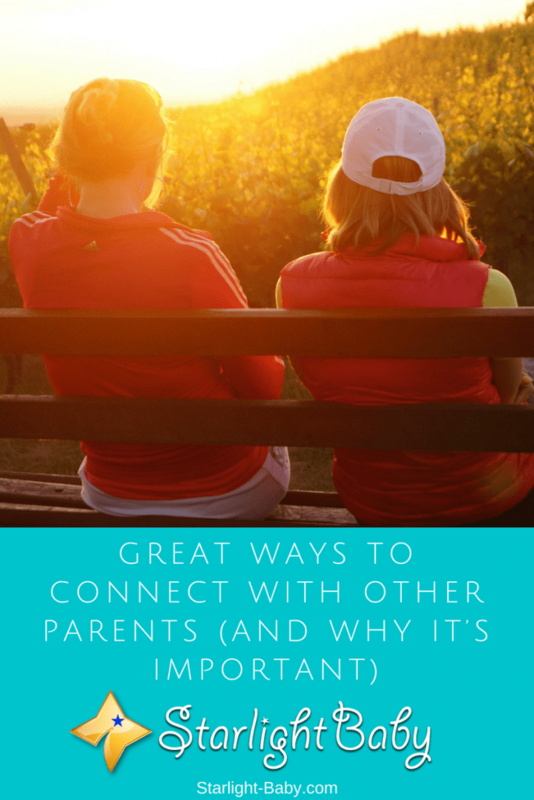 Do you have your own tips on connecting with other parents? How did you get out there and meet new people? Let us know below, and remember to sign up to our forum if you haven’t already! Great tips! I’d never heard of those apps. Meeting new mom friends can feel hard and intimidating, but it’s so worth it. I don’t know what I’d have done without my fellow mamas!! Really enjoyed reading this because I had some troubles with this myself. After I gave birth, I got really attached to my baby boy (who wouldn’t??) and I neglected other aspects of my life – specifically the social one. I didn’t realize how good it is to find other mother’s that you can talk about anything and everything! They go through the same things as you do, every day. You can share so many little tips that make your life with a baby easier. The way I found to be the easiest is the park. I take my boy there every day anyway and one time I finally built up the courage and talked to two other moms there. Let’s just say we’re best friends now. We met up at the park and chat while watching our children. We also love to go to each other houses, have meals and do other activities together. Like you’ve said. To all the moms out there: don’t forget to bond with others! Wow! That’s wonderful to hear, Jane Lee. It’s important to bond with other parents who have common experiences with us. Just having conversations with them about our frustrations can take off some of the stress. As you’ve said, a parent’s social life is the first thing to go after giving birth. We become isolated in the process and in the long run, we find ourselves alone and have no one to turn to. Not that I am sorry to have given birth to my kids. They are my life, but sometimes, we really need to socialize and talk to someone else aside from our husband and children to keep our sanity. This idea of yours never occurs to anyone – some unspecified fears could be the cause. You have clearly explained why and how to go about it. My thoughts exactly, iamawriter. I have made friends with other parents whose kids are in the same class as my sons and daughters. I believe that’s one of the best ways to meet other parents – everyone already has something in common, and some deep friendships develop from it. Really great to know there are phone apps to connect with other mothers. When my first child was born thirteen years ago, I had post partum depression, I can openly talk about this only now. It is very true to have someone to talk to especially when you feel something strange about how you feel towards your baby and yourself. Thanks to my family and close friends, I was able to get through it and shared all my experiences with them. Open communication with mothers also helped. That must have been really difficult for you to experience postpartum depression without being able to openly talk about it. Thank God for family and close friends. Having them to support us emotionally, psychologically and with whatever things we need help with is a really big thing. I don’t know how a person can survive and keep his/her sanity without having someone to talk to about problems. Some of these are great options for younger mothers, however, many of these option are of little help for older mothers who are often treated as outcasts at baby and toddler groups. Apps again are a great option to organise meetups etc. if you are in an urban area but they lack effectiveness for rural mothers. Most parents or parents to be, on the apps I have tried are at least 400 kilometres away, not so good for organising meetups. Have you considered writing any articles to help those of us in the older mother or rural demographic ? Sorry to hear about this kind of treatment against older moms. That’s really sad. I can’t imagine how they’re able to do that. We’re all mothers no matter what age and the fact that we all have kids are common denominators. Yes, you’re right. Even if there are apps to connect with other parents, it would still be difficult to really share experiences if they’re far from us and we’re unable to personally meet them. I believe a face-to-face talk is still one of the best ways to rid ourselves of stress and depression. As a new dad, I am not very comfortable with connecting with other parents. First of all, the experienced parents most of the time tend to be preachy. Secondly, there will be a comparison between the babies. Thirdly, they cannot be right all the time. Of course, connecting with experienced parents will be a help, but there will also be some problems. I don’t like people telling what should I do and what I shouldn’t do. I am an educated man and I have my own understandings. I don’t like when comparision is done between the babies. These are the problems associated with connecting with parents. Yes, there will be parents who talk as if they know it all. However, not everyone is like that. There are still people who know how to treat other people with respect, not act as if the person they’re talking with knows nothing. These are the kind of people you need to connect with – people who share helpful tips and experiences, not tell you what to do or criticize you for your mistakes. Definitely, not everyone know how maintain good relationship with someone they just meet in a group or association. The mistake some people make is pretend that they are perfect when they aren’t, and this would only make them become judgemental when it comes others. Personally, I’m not comfortable being in the midst of such parents, I do myself the simple favour of staying far away as possible because such people would only compound your problems instead of helping you with it. You’re so right, Martinsx. Some people do not have manners, haha. We definitely need to stay away from such kind of people because they could only bring us stress. Feeling isolated and bored at home is never a good experience to any parent, sometimes it can lead to feeling depressed which is not a good feeling at all because it’s detrimental to one’s health. I find the use of going online and turning to one’s phone as one of the most effective way to curbing this problem. You would be stunned with the number of friends (good ones) you could make online if you are the socializing type. This is definitely going to get you talking and close to one that is disposed to be your partner online. Also, I think that joining local groups that are beneficial to you will also be helpful. Yes, it is definitely not a good thing to isolate one’s self from other people, especially from our good friends. They will be our connection to the outside world; they will give us some form of a social life. I’ve been isolated before when I was raising my first child and it’s not a good thing. As they say, “No man is an island.” So go out with friends or meet other people online. It would hugely help you keep your sanity. Joining local groups can go along in helping, especially new parents, to settle down with parenthood and learns tips and ways they can handle each phase better. The truth is that some of these parents that will be in such groups had better experience while they had babies and sharing issues with them will assist to calm nerves and find better ways to push through. Also, things we learn online cannot be overemphasized considering that lots of information are packed on the internet that can help these parents can get better too. Great tips that are discussed here would be very helpful in getting parents enjoy themselves and hook up with others parents to possibly share their experiences as families. I find joining local groups and going online to be very helpful in getting parents connect with one another out there in the society.